Availability : We depart any day during dry season with 2 people. Not available Dec-March. Ever wanted to hike to Machu Picchu with nothing but clean mountain air and gorgeous vistas to accompany you? Then the 5D Ancascocha Trek to Machu Picchu is for you! 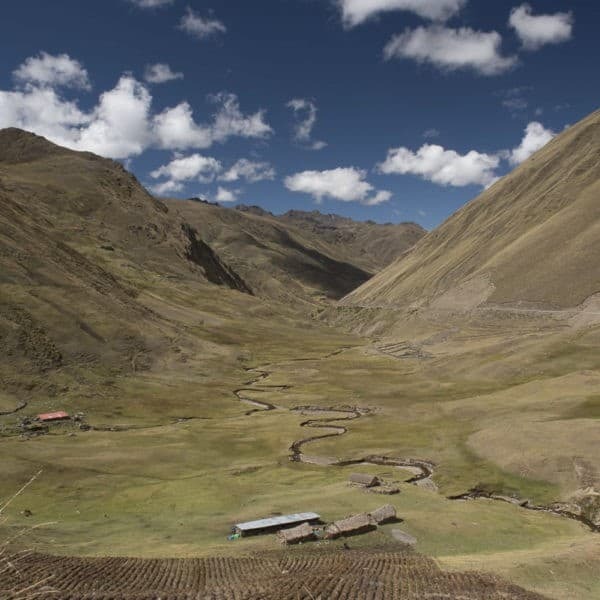 This Ancascocha trek combines amazing history, spectacular vistas and a glimpse of modern day Andean life. You’ll trek through high Andean Quechua farming villages, pass jewel-like glacial lakes, and camp in the shadows of the region’s most impressive peaks, from Salkantay to Humantay and Huaynanay, and more. 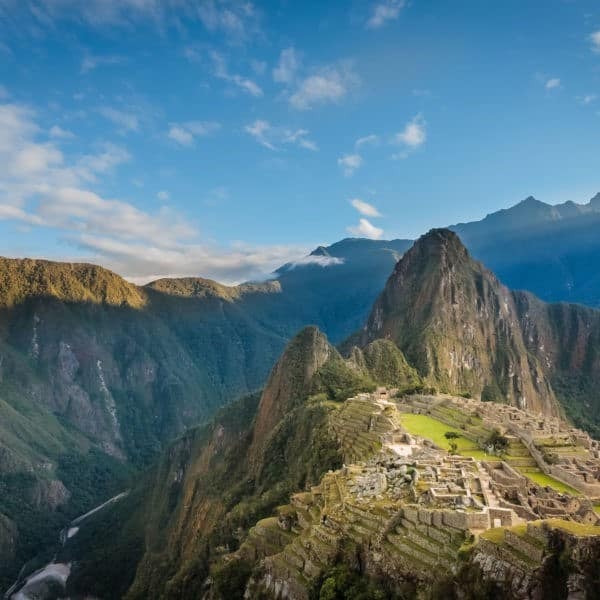 Walk along less-travelled Inca trails, no less impressive in their ingenuity and historical significance on a route that formerly connected the Incan sites of Limatambo, Mollepata, Machu Picchu, Choquequirao and Chinchaysuyo, to reach the impressive Incan Citadel of Machu Picchu. 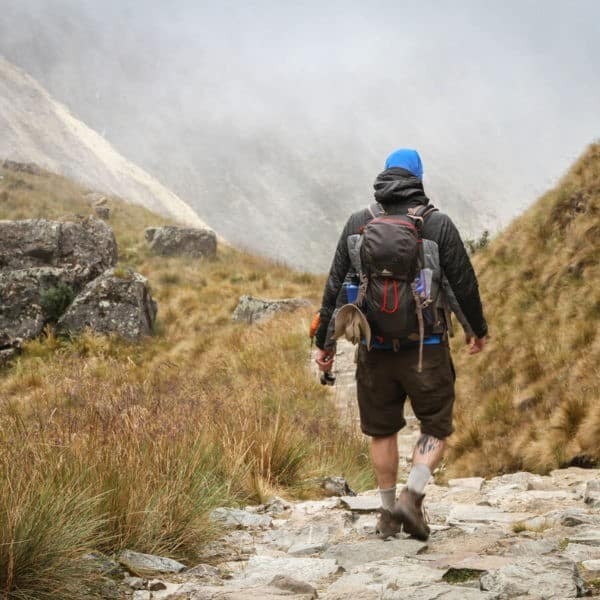 This isolated Ancascocha trek is a true adventure for those craving a chance to commune with nature as they hike the real Andes on their way to Machu Picchu. A chance to experience the Andes in their full splendor without the clamber of a multitude of trekkers. 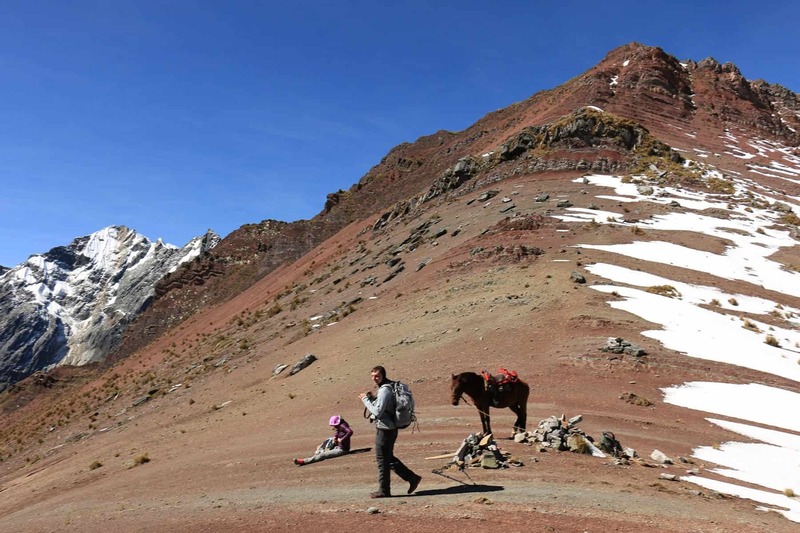 The Ancascocha Trek is a high altitude trek with multiple high passes, rocky terrain, turquoise lakes and snow-capped peaks. You can also expect to see traditional stone houses belonging to local farming villages, some Inca ruins, and a bit of Andean wildlife. And of course, Machu Picchu on Day 5! 1 night accommodation in Aguas Calientes in a nice, clean and safe Standard Hotel with breakfast included and private bathroom. For greater comfort, consider upgrading your hotel. Entrance to the hot springs at Aguas Calientes. Huayna Picchu or Machu Picchu Mountain entry fees. Must be requested at time of booking. See What To Bring for our comprehensive recommendations on what to pack for your trek. Note that this trek is particularly cold. Make sure you have enough very warm layers with you! 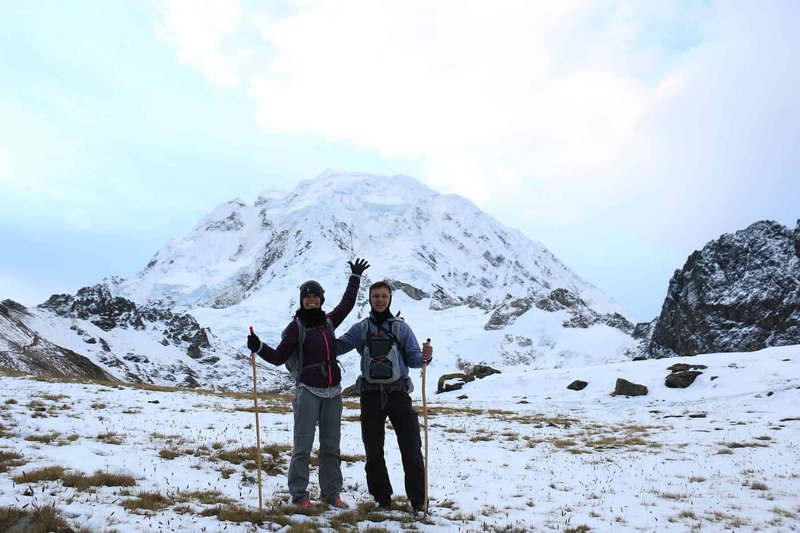 For more great suggestions, check out our blog about How to Prepare for a Trek in Peru. The Ancascocha trek is tough and should not be done as a “first time ever trek.” Most trekkers find that it is harder than they expected. If you do not have prior trekking experience, you should not attempt this trek. You should be well acclimatized, fit and hardy! Trek conditions vary according to the season. In the dry season the trail can be dusty; in the wet season, it can be slippery and muddy. Apus Peru takes no responsibility for trail conditions, as it is directly related to the weather. This trek includes transportation by train from Aguas Calientes to Ollantaytambo on the Expedition service (Tourist Class), followed by bus transport from Ollantaytambo to Cusco. Train times are variable and according to availability. If you’d like more flexibility in your return travel to Cusco, consider upgrading to the Vistadome train (Executive Class) for an extra $30 per person. This upgrade must be requested at time of booking. We pick you up from your hotel in our private transport and drive for approximately 3 hours to Mollepata (2870m / 9416ft) where we will have the opportunity to buy a few last-minute snacks and supplies. From here, we continue another hour to Soraypampa (3840m / 12,598ft) where we’ll begin to walk. After hiking through fields, we’ll continue walking to Salkantaypampa which is also the starting point for the popular Salkantay trek to Machu Picchu; we will continue hiking several hours until we reach Pampa Japonesa (4600m / 15,091ft) the base of snow-capped Salkantay (6264m / 20,551ft) and Humantay (5217m / 17,116 ft) mountains, where we will have lunch. Once we’re good and rested, we continue to Inka Chiriaska for and 1:30hs; Inca Chiriaska is a high pass at an astounding 4959m (16,269ft) from where we will have views over the area’s breathtaking landscapes. From here, we descend to our campsite at Yanaq´aya lookout. After a nourishing breakfast to get us ready for the day ahead, we step onto an original Inca trail, retracing the steps of ancients until we arrive at Toqto Pass (4850m / 15,912ft), where the trail then continues on towards Salkantay. We carry on for 2h to Calacocha Pass (4667m / 15,311ft) and then another hour to Cruz Casa (4600m / 15,091ft) and then Millpo Pass. From here, we descend to Millpo (4399m / 14,434ft) where we will have lunch. From Millpo you will trek up for an hour until we reach Qosqueñaq pass (4600m /15,091ft) and then descend to Yahuarmaky to set our camp. We’re off to an early start this morning, with a lot of terrain to cover! First, we make our way to Chusqenay Pass (4630m / 15,191ft) before descending to Rumi lnca Pass and then up and over to the narrow Yahuarmakay Valley. After this, we start climbing again, another 1.5h until we reach Aqocasa Pass (4686m / 15,374ft) atop a gorgeous, sandy, reddish colored mountain. 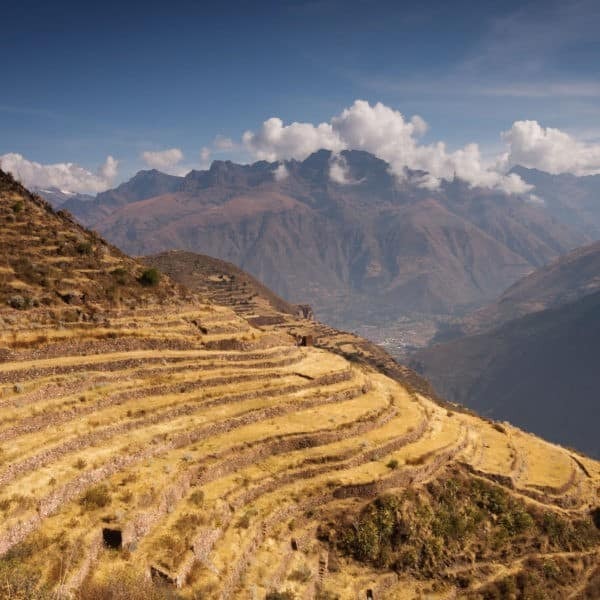 From here, we can actually look across the range to view the famous Inca Trail to Machu Picchu! We’ll also have a moment to take in our surroundings, the beautiful Salkantay, Humantay, Huayanay, and Huacaywillka (Sacred Tears) mountains, and pass the Incan archaeological site of Inca Raqay. From here, we descend 3 hours to Inca Rakay followed by a 1.5h ascent to Huaynanay Pass (4630m / 15,191ft), and down again to our campsite at Ancascocha (4400m / 14,435ft). After three long and strenuous days of high altitude hiking, we are in for a bit of an easier day today as we lose elevation and walk down from Ancascocha to the town of Chillca. Over the course of about 5 hours, we’ll pass through small Andean villages and have the chance to take in lots of native vegetation, including chachacoma and qeuña trees as well as orchids, begonias, and bromeliads. By the time we reach Camicancha (2930m / 9612ft), our descent will become even easier as we continue on to Chillca, near Ollantaytambo. We arrive in time to catch our late afternoon train to Aguas Calientes where we will enjoy a celebratory dinner and spend the night in a hotel. And now, the pièce de résistance: Machu Picchu! All our hard work has paid off and we can spend today taking in this magnificent piece of Incan history. From Aguas Calientes we’ll take a bus in the pre-dawn hours up to the site in order to take in the magnificent sunrise from the Guardhouse (aka Watchtower). Your 4h visit to Machu Picchu can be spent exploring some of the alternative routes, like the Inca Bridge, after which your guide will give you a 2-3h walking tour of the historic citadel. After taking the bus back down to Aguas Calientes, we will make our way back to Cusco via train to Ollantaytambo and then private transport the rest of the way. The return trip takes about 4h in total. Availability : We depart any day with 2 people. This trek is really fantastic. No tourists, breathtaking views, and a real challenge until Machu Picchu. Our guide was truly outstanding and was also a very pleasant person to be around with. His knowledge of the mountains and his help throughout the journey made this experience top notch. A special mention to the porters and to the chef, who cooked us super impressive food at very high altitudes. 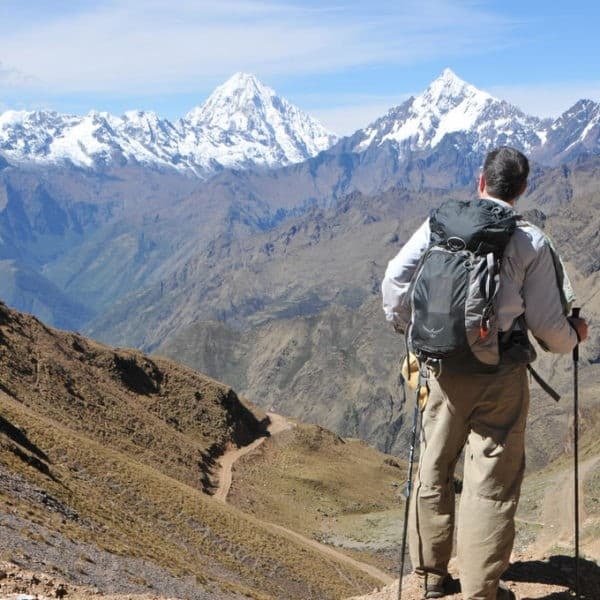 I would therefore very highly recommend Apus Peru for their knowledge of the mountains and also their alternative treks which are very special. If you want to avoid other tourists and groups along the way and embark on a challenging adventure this may be your best bet. I don’t see how one could be disappointed. We opted for the Ancascocha trek as we wanted if possible to enjoy the mountains without the crowds. The trek was quite hard work but hugely satisfying and we were lucky with the weather. The Apus team on the trek were hard working, cheerful and competent. Our guide inspired great confidence and was knowledgeable as well as being excellent company. The planning was helped by an informative office team who discussed our requirements and worked with us to ensure that we got the most from our trip. During our time acclimatising to the altitude we also did 2 guided day trips with Apus, with another equally excellent guide. These were hugely informative as well as good fun. I cannot recommend Apus more highly. From the start the Apus Peru website gave all the right messages – environmental awareness, concern for local staff and support for Threads of Peru. Email discussions with our sales representative were really helpful and he suggested our final choice of trek, the Ancascocha alternative. For two experienced, but ageing (one of us was over Apus’s stated maximum age! ), mountain walkers, 5 days acclimatisation in Cusco was essential and we picked 2 of the Apus day trips to break us in: the “Four Ruins” Cusco day and the Moray/Maras trip. Our guide for both days, was friendly, informative and really knew his stuff. We had told our sales representative that we wanted a trek that avoided the crowded, popular routes and the Ancoscocha trek was everything we had hoped for. 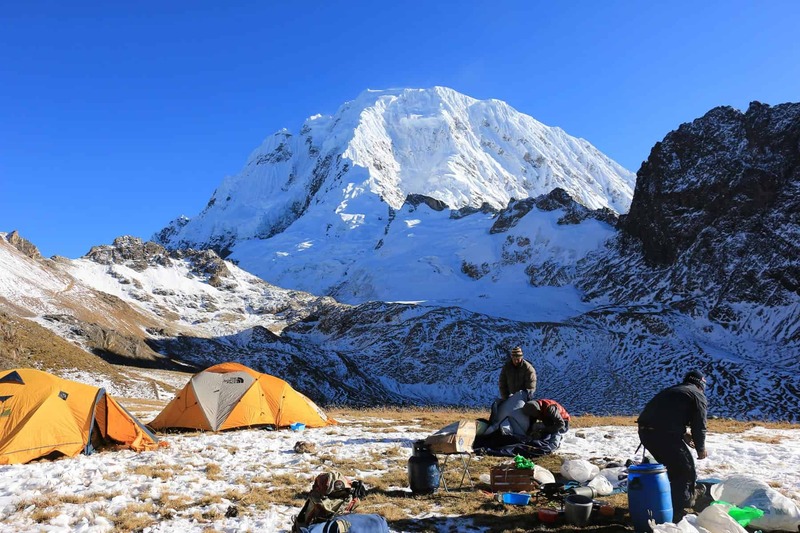 It was described as “difficult-strenuous” and certainly tested us with the first camp at 4600m and a pass at 4959m early on the second morning, but our guide was patient and encouraging as well as being great company. We saw no other trekkers at all once we left the Salkantay route early on the first day and were able to enjoy the solitude and peace of the mountains to the full. Our cook, performed miracles thrice daily in his attempts to out-perform in a tent any of the restaurants that we had visited in Cusco. Horsemen, horses, camping gear, transport, environmental care and all the logistics provided by Apus worked seamlessly to ensure that the trek and day trips were the memorable experience that we had hoped for. Well done Apus and thank you for making our time in Peru such a success.The initial good vibes from your website were not just hype!